If the undertaker’s daughter had been a child in Britain in the early twenty-first century she would have been whisked off to social services and foster care. Luckily for her, she grew up in a small town in Kentucky in the 1960s and nobody seemed worried that she was spending her time talking and thinking about death, and especially about the disposal of the dead. Her father was was a funeral director and more: he did his own embalming, dressed the body, posed it carefully in the open coffin and welcomed the people who came to pay their respects. From the first moment that she sneaked into the forbidden rooms to look at a newly embalmed corpse, Kate was fascinated by her father’s profession and since the family lived above the shop, she had plenty of opportunity to see, or rather spy on what happened to dead bodies both before they were embalmed, and afterwards, lying in their best clothes and thick face paint in their open coffins, ready for the ritual viewing. The telephone would ring at any time of day or night, and Daddy would dress himself formally and drive off to collect a body. The body, however, might be a living one. In a town without welfare services, a hearse often had to double up as an ambulance. One of the people given this service was Miss Agnes, to whom Daddy becomes a kind of surrogate son. 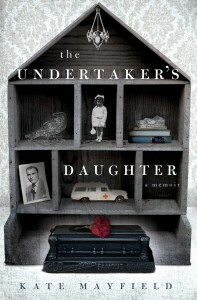 When she dies Miss Agnes leaves him her house, the best building in the town and the undertaker’s family moves in. But the undertaker himself – Daddy – becomes gradually less able to hide his alcoholism and his infidelity. The story of Kate’s father ends sadly, with his decline and death. This memoir of growing up in the funeral home is beautifully written and rather touching. It also tells us a great deal about life in the South at that time. There are Kate’s mother’s afternoons of playing bridge, the ladies fortified with such delicacies as ‘congealed salad’ and sweet iced tea, while downstairs Daddy is embalming a corpse and the black maid Belle labours in the kitchen, emancipated but not equal. For in fact this community is still strictly segregated. While the white corpses give rise to fierce competition between Daddy’s firm and the town’s rival undertakers, Daddy would not touch a black body. Another undertaker takes care of them.